Father, Hallowed is Your Name! Let me begin by reaffirming that reciting this prayer from start to finish weekly in church, or even daily is not Christ’s intention. We understand that prayer is more than asking for and getting answers. Prayer is the heart of our relationship to God in Christ Jesus, and has every bit as much to do with our hearing from God, as it does us speaking to God. That reality is for another time, but sufficed to say, reciting “the Lord’s prayer” is not what Jesus had in mind. What did He have in mind? Simply put, to provide us with a pattern, that as we wait on God He directs us concerning what to pray and how to prioritize the what under normal circumstances. In the first place, we are to be aware of the awesomeness of God as revealed in His role as our Father (Abba). We have heard the question “What’s in a name?”. For our God and Father His character and personal relation to the crown of His creation (us) is revealed in His name. As we begin in prayer, we are to be in awe with joyful thanksgiving, as His name reveals His personal care for us. This rejoicing is then the gateway to His presence, as God sits enthroned in the praise of His people (Psalm 22:3). Before we look a bit further at our Father’s Hallowed name, lets remember that Jesus calls us to the secret place to pray, where we set apart the time to meditate on our God’s glory and grace to us in Christ Jesus. Setting apart this time as for God alone does not deny that there are times when we come boldly before the throne of God, to obtain mercy and grace in a time of need (Hebrew 4:15). In spite of the need for bold and desperate prayers Jesus’ model is to be our consistent guide and we need to be deliberate and well paced, or we will miss God in our praying. Let’s consider Jesus first instruction “Our Father in heaven, Hallowed be your Name”. As magnificent as these names for God are in communicating His nature above all other gods, they do not communicate the personal nature the name Father (Abba does). It is for this reason Jesus is referring to God’s chief name in revealing Himself. That name is YHWH. This name for God is referred to by the Jewish people as “The Name”, and is unspeakable to the most Orthodox. remarkably of Jesus Christ our Lord, this is the name given to Him that is above every name, from Philippians 2:5-10, which was written by Paul (self-defined Hebrew of Hebrews), who knew the significance. (Philippians 2:6-11) 6 who, being in the form of God, did not consider it robbery to be equal with God, 7 but made Himself of no reputation, taking the form of a bondservant, and coming in the likeness of men. 8 And being found in appearance as a man, He humbled Himself and became obedient to the point of death, even the death of the cross. 9 Therefore God also has highly exalted Him and given Him the name which is above every name, 10that at the name of Jesus every knee should bow, of those in heaven, and of those on earth, and of those under the earth, 11 and that every tongue should confess that Jesus Christ is Lord, to the glory of God the Father. The theological term for the name above every name “YHWH” is the tetragrammaton. What this name means is simply “I exist”. One may find this a bit unremarkable, but remember this is coupled with the knowledge that “I Exist” is “The Most High God” and “Lord and Master” and “The Lord God Almighty” and “The Everlasting God”. Yet when we explore further, we find “I Exist” with what follows it, we find something remarkable to guide our heart to prayer and praise…. (Genesis 22:14) YHWH-Jirah reveals to those in the faith “I Exist to provide atonement”. This is so very important for this name was revealed to Abraham when he was commanded to sacrifice his son Isaac. As the word of God records the Lord commanded him to stay his hand. He did and as Abraham earlier declared to his son “the LORD Himself will provide a sacrifice”, so “I Exist” did. Why is this important to us? It communicates the truth that from the beginning YHWH exists to Himself make atonement for the sins of man through Jesus Christ (I Peter 1:19-20; Revelation 13:8). (Exodus 15:26) YHWH-Rapha reveals “I Exist to heal you”. After Israel came out of Egypt God declared Himself to be the LORD that heals you. This promise to all the faithful from both Old and New Testaments ,through the atonement of Christ in His sacrificial death. As with the previous name God giving of Himself to those who do not deserve the benefit of His presence in our lives (Isaiah 53:3; I Peter 2:22-25). (Exodus 17:15) YHWH-Nissi was revealed at the conclusion of Israels defeat of the Amalekites. This name means that no matter what we face or fight again “I Exist as your banner of victory”. Simply put YHWH exists to fight our battles and bring us victory through Christ. (Exodus 31:13) YHWH-Mekoddishem I am the LORD who sanctifies you. In this revelation of His character Abba reveals “I Exist to set you apart and make you holy as I am holy” This is a great relief to the sincere lover of Jesus who wants to obey and glorify Him with His life (I Thessalonians 5:23; I Peter 1:13-16). (Judges 6:24) YHWH-Shalom was revealed to Gideon in a time of great anxiety. The timid man to God was called to go up against an impossible enemy and YHWH declares His name above all names is “I Exist As your peace”. This of course is repeated by Jesus in John 14:27 and repeated in the New Testaments warnings to be not anxious because Christ Himself is our peace (Ephesians 2:14). (I Samuel 1:3) YHWH-Saboath means “I Exist as the LORD of the armies of heaven”. This is important for the armies of heaven fight on behalf of the faithful, in fact we know specifically that Jesus is the “Captain of the LORD’s hosts” (Joshua 5:13-15). Is it any wonder we find that angels minister to those who inherit salvation (Hebrews 1:14). (Psalm 23) YHWH-Raah The LORD is my Shepherd. Our God “Exists to personally lead us through life”. (Ezekiel 48:35) YHWH-Shammah In another prophecy concerning Israel in exile, the LORD tells them of their return to the Jerusalem, where He declares concerning the city “I Exist to dwell therein”. Now this prophecy only had partial fulfillment in their return from Babylon. Its ultimate fulfillment is on the Great Day when the throne of God and the Lamb is in the New Jerusalem (Revelation 22:1-5). Yet this name of God “I Exist to dwell therein” is fulfilled in His dwelling in followers of Christ through the Holy Spirit, as well as in His church (John 14:21,23; Colossians 1:27; Ephesians 2:19-22;I Peter 2:4-10). It is this last revelation in the name YHWH that makes all the rest possible. Let us remember that this exploration of the name of Father which is “Hallowed” is in relation to prayer. As we head into secret communion with God it is right to meditate and praise Him for His greatness revealed in His name. It is more than possible that on any particular day, life and what you have encountered will bring reverence, gratitude, praise or the fear of the Lord based on the character of Abba revealed in His great name. At the very least we can understand through His name why it is the name above all names. All the other gods are selfish and self-serving. These false deities do not do anything that does not need coaxing from humans, and in vile and common ways at that. YHWH “I Exist” EXIST’s to give of Himself freely to any who come to Him through His Son, Who is the heir of THE NAME!. Take some time to consider how the God above all, who “holds all things together by the Word of His power”, EXISTS to bless you with His presence and love. 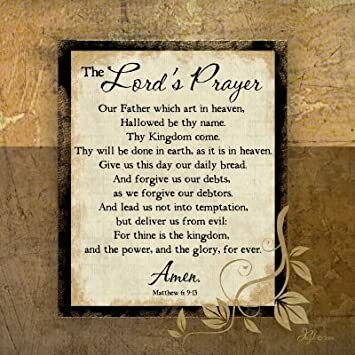 This entry was posted in Matthew 6:9-13, The Lord's Prayer, The Name above all names, Uncategorized. Bookmark the permalink. 1 Response to Father, Hallowed is Your Name!